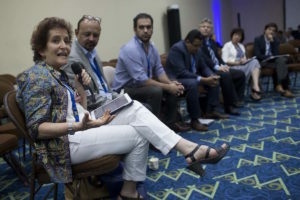 Representatives of local Transparency International chapters in Latin America took time during the 17th IACC to evaluate and reflect on the past two years of struggle against corruption in their countries, specifically in Brazil, Guatemala, Honduras, Colombia, Chile and Argentina. The session, moderated by Jimmy Bolaños (Costa Rica Integra), aimed to identify actors and factors that led to the increase of effectiveness in the combat of corruption in the region recently as well as to evaluate current situation and perspectives towards the future. Alberto Brecht, from Chile Transparente, highlighted land speculation scandals (tied to president Michelle Bachelet’s son and daughter in law) and the infamous Penta Case as catalysts that increased public interest in corruption and led to decisive “electoral punishment” for candidates tied to the corruption. He also mentioned that even though Chile has not had demonstrations specifically oriented towards corruption issues, corruption scandals were always a factor in mobilizations related to other topics. Brazilian federal prosecutor Monica Nicida explained the significance of the 10 measures Brazilian civil society organizations and the country’s judiciary proposed to the country’s lower chamber. The proposal reflected and synthesized the experience accumulated in the “Car Wash” investigation, which she considers to be a highly effective operation against corruption in the country. Carlos Hernandez (ASJ Honduras) explained how the recent anticorruption trend in Honduras that was inspired by their neighbor Guatemala, highlighting the importance of popular demonstrations of Marcha de las Antorchas which led to the establishment of an international anticorruption committee, under the auspices of the OAS. From Argentina, Paulo Sergi (Poder Ciudadano) spoke about the recent election of Mauricio Macri as president, who has pushed for the reinvigoration of already established anticorruption bodies, mainly in the judiciary. However, Sergi expressed his concern that this anticorruption trend might be more an opportunistic image play than actual conviction, and only time will tell these efforts will continue. Manfredo Marroquin of Accion Ciudadana in Guatemala stated that the struggle against corruption in the country is nothing new, having its roots in 2004 with transparency tools for governmental accountability and a 2008 transparency law. Marroquin also underlined that the 2006 international anticorruption commission CICIG was a game changer, so much so that potential corrupt outside investment in the the country has ceased. Although this has lead to a reduction in corrupt private investment, the lack of investment – corrupt or not – has raised new problems for Guatemala. From Colombia, Isabel Hungart (Transparencia por Colombia) made it clear that current concerns in the anticorruption crusade in the region are now essentially tied to the peace negotiations between FARC and national government. By moving the guerrilla out of institutionally weak zones, she fears the rise of mafias seeking to place members in institutional power. Even though the normative framework in Colombia is, according to her, good, it is still unclear whether it will be able to face this new corruption context which will eventually arise after the cease of guerrillas. Session coordinator Eduardo Nunez Vargas (Costa Rica Integra) finished by identifying 6 common factors currently experienced in Latin America as a whole: the sense of urgency on corruption matters; the most effective initiatives against corruption are multi-stake-holder; there is a need to establish new and more agile legal frameworks; the idea that small victories are relevant; awareness regarding the importance of communicative dynamics and, finally, the lack of support from political and economical elites. “Progress has been made, but there is still a long way to go” were his last words. Pedro Noel is co-editor at the Associated Whistleblowing Press. He analyses and publishes leaked materials since 2010 and has helped build digital whistleblowing initiatives in Mexico, Iceland, Spain, Peru and Ecuador.